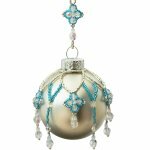 The Winters Grace Ornament is a delightfully pretty ornament that will sparkles away with grace and style . It is so quick to make up, yet looks so detailed and intricate. Have fun choosing beads and colours to match your plain ornaments! Wether you choose to bead this ornament for a Christmas decoration or to display all year round this ornament is a must have for your collection. As usual with ThreadABead featured patterns we give full detailed photographic instructions and in this pattern there are 36 detailed steps, making this pattern even suitable for beginners to beading. This ornament bead pattern is made using Japanese Miyuki size 11 Delica. A form of round peyote is used but full detailed instructions are given and no previous knowledge of the stitch is required. Please note the pattern may not work with any other size and type of beads. There are 2 delica colours in total and the finished beadwork is approximately 5.25 cm x 6.25 cm (not including loop). The ornament is mounted on a 6cm silver or clear bauble. 22 x 3mm Firepolished Crystal AB, 29 x 4mm Firepolished Crystal AB, 11 x 6mm Firepolished Crystal AB are also required The bead pattern supplied is 12 pages and includes 36 full colour photo instructions.